This is part 1 of a two part blog on my recent Chicago Trip, part 2 tomorrow. 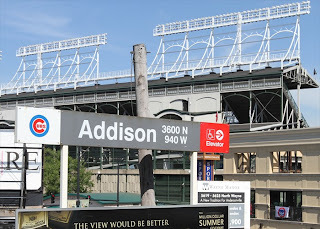 I returned over the weekend from a whirlwind Windy City trip with the Mesa Hohokams that included two games at Wrigley. In case you’re unfamiliar with the Hohokams, they are the civic group who help the Cubs with things like ushering, parking, and selling programs during spring training in Arizona. In our two games we saw the epic Marmol meltdown game on Thursday and a Dempster dandy on Friday. Hey, 1-1 for our two games is not bad. Now if the Cubs were actually playing .500 ball for the season, they would only be 3 –yes 3– games out of first place in the division. The Cubs loss notwithstanding, the trip was a blast and included many memorable moments, like standing in right field at Wrigley, feeling what it would be like to patrol the outfield like Dome or The Hawk did. On this trip I brought along my brother Jamie, or as he affectionately became known to the Hohokams – Jim. I got to play tour guide for Jim, er, Jamie, as he had only driven through Chicago a couple times and never been to Wrigley or seen the city proper. We arrived at O’Hare at about 11:30AM on Wednesday, which meant our flight left Phoenix at 6AM, which meant I got up at 3:15AM. Ouch! This early up time reminded me of the days I worked on the FOX-10 TV morning show, and I had to arrive at the station at 1:30AM. Yes, I once worked for Rupert Murdoch, but it was at a Phoenix FOX affiliate station and not FOX News. Back at that time the Internet was just getting going, so we were still tapping phone lines manually and steaming open letters by hand. I’m kidding about the espionage, and also digressing. Wednesday – After arrival and check-in at our hotel, I met with Chicago Sun-Times columnist Elliott Harris. Elliott writes the humorous sports related column – Quick Hits. 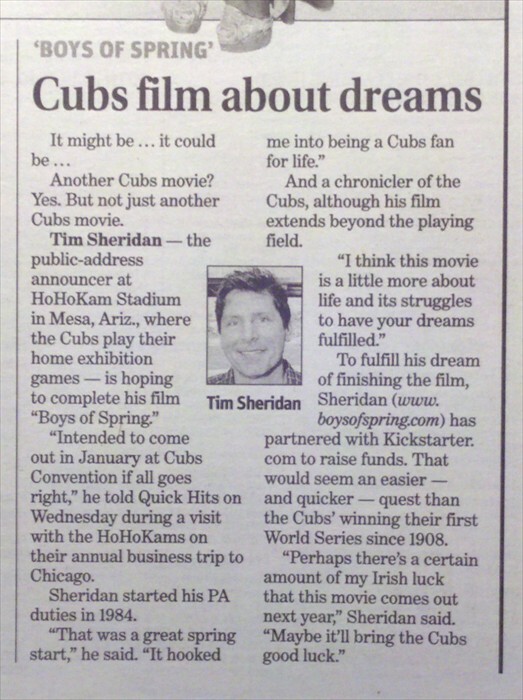 He interviewed me about Boys of Spring – The Movie and our Kickstarter efforts to help complete the film. The article appeared in Thursday’s edition, you can read it here. By the time I had finished talking with Elliott, it was going on 2PM and both Jamie and I were starving. 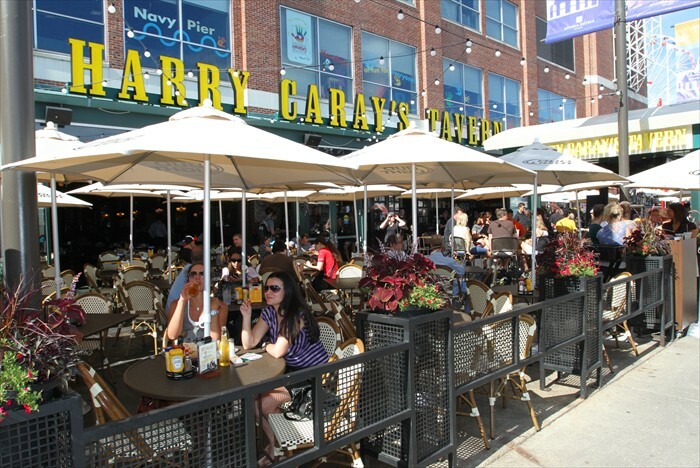 So we made our way down to Navy Pier as I wanted to visit the new Harry Caray’s Tavern there and talk with them about the film. It was 76 degrees and sunshine, so we pulled up to a table in the patio area with good sight lines of the promenade entrance. Jamie decided to keep with the Chicago theme and went for the Old Style. We got some eats and watched the happy tourists and locals come and go. We were happy, too. The outdoor thing really isn’t happening in Phoenix during the summer (115 degrees tends to keep people indoors with air conditioning), so this was a treat for us. I know it’s hot in Chicago now, but we had perfect weather while there, high temps between 75-83 with low humidity. 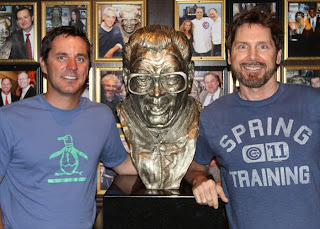 After getting our pic taken with Harry Caray’s head, we met up with the Hohokams for happy hour. They gave us our tickets for the Thursday game which we would view from the Budweiser Batter’s Eye Bleacher Suite. Later that evening Gino’s East topped off our first day of Windy City culinary delights with some Chicago deep dish pizza. Jim stuck with the Old Style. Our plan for the next day started with food in mind as well. 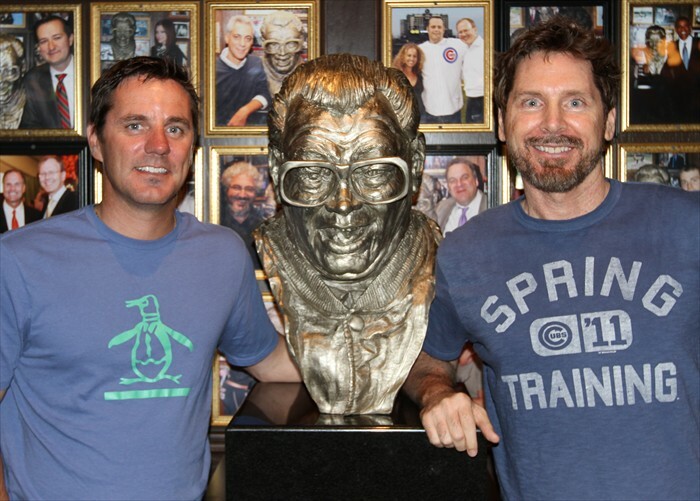 Thursday – The Cubs game was a night game so we had some time before heading to Wrigleyville. Our plan was to hit up Tempo Café for breakfast, I had been there before and really liked it. 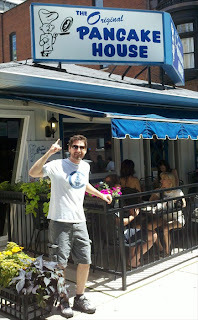 As we walked up Rush Street to Tempo, we looked over and saw the outdoor patio of an Original Pancake House restaurant. I’m a sucker for the flapjacks and it was still a few blocks to Tempo so we changed plans and I was soon pouring maple syrup on some buttermilk beauties! We then kicked it for a while downtown and decided it would be cool to take Jamie up to Wrigleyville early so he could get a feel of the area before the masses set upon it. Also, I have been caught a time or two over the years on a packed El train headed to Wrigley and can say without a doubt that the Cubs ball game experience is in no way enhanced by your own sweat or that of your fellow Cubs fan. We arrived in Wrigleyville around 3PM for the 7PM game. Jamie immediately purchased a new Cubs cap and then we began our Wrigleyville walkabout. The journey included some brief stops in establishments here and there, a walk by the players parking lot (where we saw A-Ram pull in), the fire house, and chatted with some fans already in line for the bleachers. If you know the logistics, that put us at Murphy’s Bleachers. We scored a nice outdoor table under the shade of a tree at Murphy’s and proceeded to watch humanity arrive. Jim had Old Style. 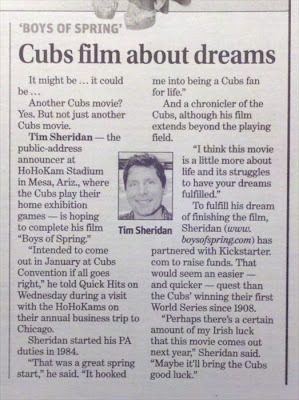 Please check out our Boys of Spring film trailer here at Kickstarter and help us get this one of a kind Cubs film made.